RLI is a specialty insurer offering a variety of property and casualty insurance coverages and surety bonds in a number of niche markets. The company was founded in 1965 by Gerald D. Stephens who observed a need for contact lens insurance and founded Replacement Lens, Inc. Over the years, the company expanded into a number of commercial property and liability fields that were historically underserved and required specialized expertise. From a standing start fifty years ago, RLI has grown into a company with revenues of $795 million and shareholders’ equity of $823 million at the end of 2015. The company has posted twenty consecutive years of underwriting profitability. This record of success has not been lost on market participants. RLI’s market capitalization is currently $2.8 billion, or 3.4 times book value. The insurance industry is generally highly competitive and has a mediocre record of aggregate underwriting profitability. Many insurers struggle to achieve breakeven results on underwriting and rely primarily on fixed income investments to provide a return to shareholders. The low interest rate environment in recent years makes underwriting profitability imperative for any insurer seeking to deliver a reasonable return on equity, but the commodity-like nature of insurance and increasing capital coming into the market makes underwriting at a profit difficult. The niche markets that RLI focuses on in the specialty admitted and excess and surplus markets are generally less competitive and offer skilled underwriters more opportunities. 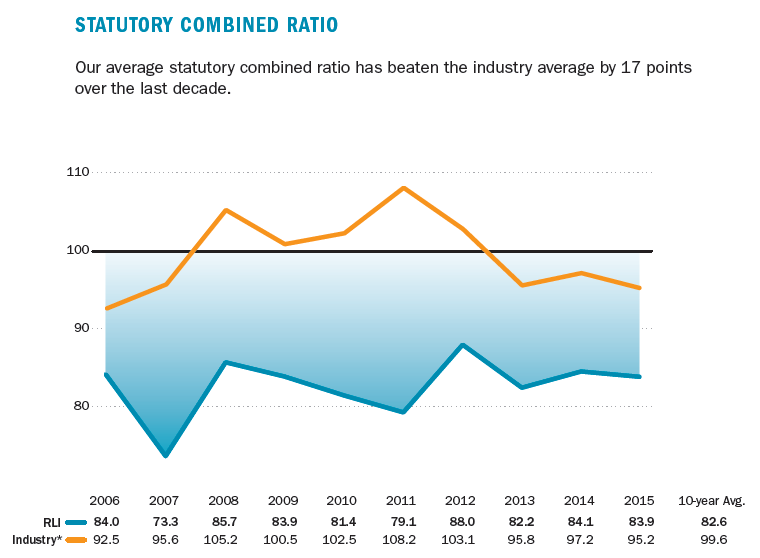 On a statutory basis (which differs in certain ways from the GAAP figures referred to elsewhere in this article), the insurance industry has essentially operated at break-even levels on average over the past decade while RLI has posted an average combined ratio of 82.6. A combined ratio of 100 represents underwriting break-even while figures below 100 represent underwriting profitability. 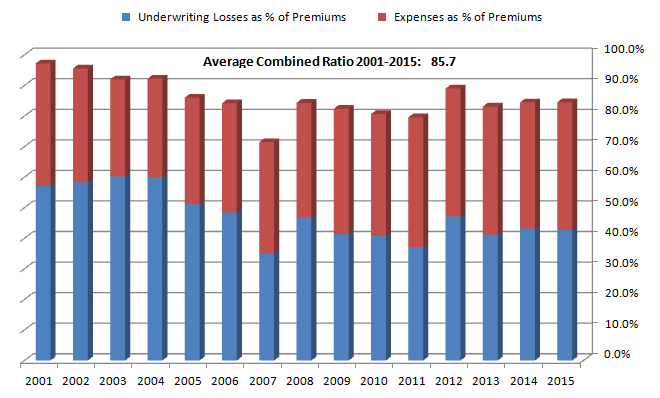 The combined ratio is the sum of underwriting losses and expenses divided by earned premiums. The exhibit below shows a more detailed breakdown of RLI’s GAAP combined ratio over the past fifteen years broken down into the underwriting loss and expense ratios. We can clearly see that RLI has an unusually strong record of profitability relative to the industry. What accounts for consistent underwriting profitability in an environment where the industry as a whole struggles to break even? The niche focus clearly plays a major role. As an example, one of RLI’s specialty personal property products covers recreational vehicles. Compared to the massive and highly competitive market for auto insurance, which is dominated by a few much larger players, RV insurance is a small niche where industry expertise and longstanding relationships are likely to play a significant role. By employing underwriters with in depth understanding of the RV market, along with similar niche product segments, RLI can price insurance competitively but with enough margin of safety to make underwriting profits more likely. RLI’s skilled underwriting team is clearly part of the company’s “moat” when it comes to beating the overall industry’s combined ratio over long periods of time. Every publicly traded insurance company includes information on loss reserving in annual reports and other filings. RLI’s disclosures are extremely detailed and serve as a good primer on insurance loss reserving for anyone interested in learning much more about how reserve estimates are made. The nature of reserving involves numerous assumptions and estimates and depends on the judgment of management. If there is one universal truth when it comes to insurance companies it is that the current year loss figures are certain to be wrong! The only question is whether management tends to err on the side of caution or not. Except for insurers specializing in short tail property coverages, the conservatism of management’s estimates can only be inferred over a period of many years. Insurance companies include an exhibit in annual reports commonly referred to as a “loss triangle”. This exhibit shows the net liability for unpaid losses at the end of each of the past ten years along with a re-estimate of this loss figure for every subsequent year. For example, RLI initially estimated its net liability for unpaid losses at the end of 2007 to be $774.9 million. This liability was re-estimated each subsequent year. At the end of 2015, the figure was estimated to be $554.6 million. This implies that the estimate eight years earlier was too high by over $220 million, which is referred to as a redundancy. Over the years, RLI recorded these redundancies as favorable development. It is clear that RLI has demonstrated a very conservative reserving philosophy over time. One might ask whether being overly conservative with loss estimates could be as undesirable as being too aggressive since ideally one would like to be right on target so that each year’s underwriting loss accurately reflects actual losses during that year. RLI management states that they would rather be conservative given that the niche market segments in which the company operates can produce results with higher than average variability. This seems like a plausible rationale in favor of RLI’s historical approach. While there can be no assurance that reserve estimates will continue to be conservative going forward, past results demonstrate an attitude that is unlikely to suddenly shift in favor of recklessly aggressive estimation practices. Over the past decade, RLI’s earned premium volume rose from $491 million in 2005 to $700 million in 2015, representing annualized growth of 3.6 percent. Premium volume actually declined in two of the ten years. While it would be wonderful to observe rapid premium volume growth, apparently RLI’s management was restrained in terms of what business to accept in order to maintain historically high underwriting profitability. RLI could no doubt have grown premium volume much more rapidly by compromising on underwriting standards and pricing policies more competitively. However, it is certain that doing so would have impacted underwriting profitability. A disciplined insurer must be willing to turn away business when pricing is inadequate. Almost any insurer will say that this is the case but few have the discipline to act on it. One section of Warren Buffett’s 2004 letter to Berkshire Hathaway shareholders profiles National Indemnity Company. Mr. Buffett discusses how National Indemnity allowed premium volume to shrink dramatically for well over a decade until appropriate pricing returned. This letter is highly recommended to anyone interested in the insurance industry. One of the consequences of RLI’s underwriting discipline is that float growth has been limited over the past decade. Float represents funds that are held by an insurance company that are expected to eventually be paid out to policyholders over time. While float is held it can be invested for the benefit of shareholders. RLI’s float grew from $909 million at the end of 2005 to $999 million at the end of 2015. The annualized growth rate is less than one percent. Due to RLI’s policy of returning all free cash flow to shareholders over time (which we will discuss shortly), shareholders’ equity and total investments have also remained rather static. 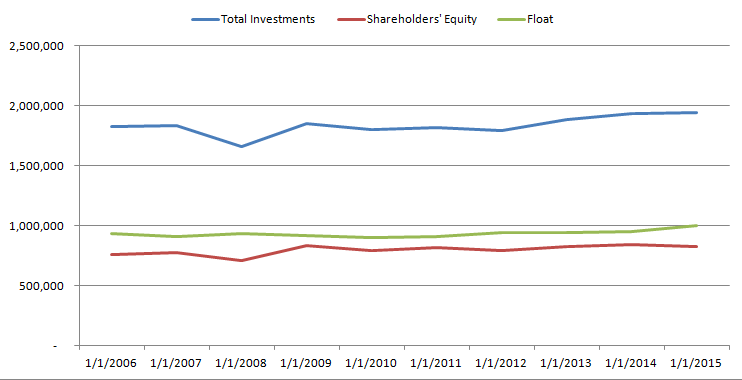 The exhibit below shows total investments, shareholders’ equity, and float over the past ten years. RLI runs a conservative investment portfolio which was comprised of 79.3 percent fixed maturity investments, 19.3 percent equity securities, and 1.4 percent short term securities at the end of 2015. Figures in the exhibit are in thousands. 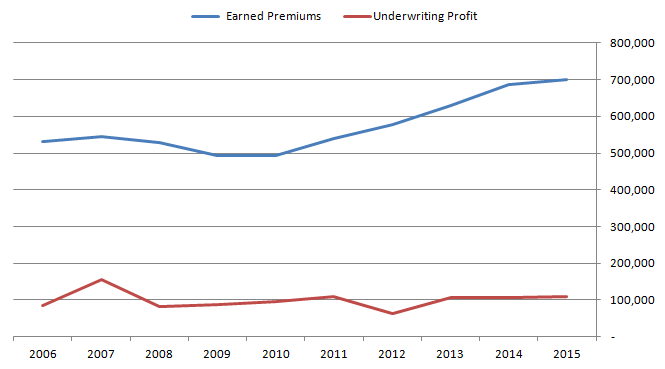 It should be noted that other insurance companies, such as Berkshire Hathaway and Markel, have managed to grow float at more satisfactory rates over the past decade while producing underwriting profits. RLI’s management has a long history of success and clearly believes that growth over the past decade could not be accomplished without compromising the company’s underwriting profitability. One might consider whether RLI was excessively conservative but it is difficult to make any conclusive statements on this point. In general, it is better for an insurer to err on the side of caution rather than aiming for potentially risky growth. As we have seen, RLI has not been a “growth company” over the past decade but the company has been a cash flow machine. Return on equity has averaged nearly 16 percent, driven mostly by underwriting profitability and supplemented by investment returns. 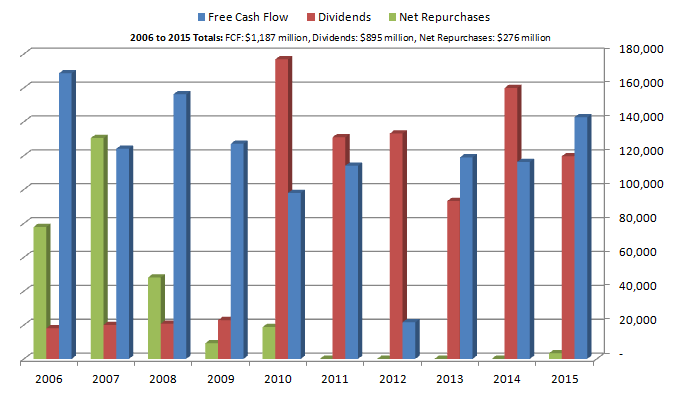 Over the past ten years, RLI has produced nearly $1.2 billion of free cash flow and has returned almost all of this cash flow to shareholders in the form of repurchases and dividends. The company pays a regular cash dividend and has paid supplementary special dividends as well in recent years. The exhibit below shows RLI’s free cash flow, dividends, and net repurchases over the past ten years (figures in thousands). It is notable that RLI has a flexible policy when it comes to cash return. From 2006 to 2010, the company repurchased shares. 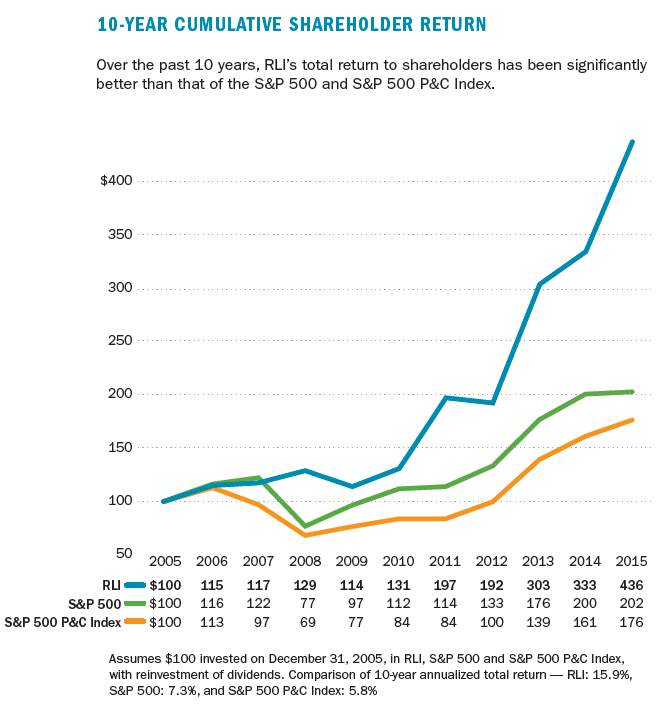 From 2010 to 2015, special dividends were the primary means of returning cash. The fact that the company has been returning cash to shareholders should be unsurprising given the limited growth in the size of the business over the years. RLI could have retained earnings for investment purposes but apparently does not seek to build up a larger equity portfolio or acquire non-insurance businesses. RLI does own a minority stake in Maui Jim, which sells premium sunglasses, but this ownership interest came about due to the company’s historical roots in contact lens insurance products and does not represent any strategy of pursuing non-insurance investments. Anyone reading this article probably has a good sense of the fact that RLI is a very good insurance company with a long track record of success. This impression would be further reinforced by reading recent annual reports. Where’s the catch? It appears that market participants generally understand how attractive RLI’s business is and have acted accordingly. The company’s price-to-book ratio rose from 1.84 at the end of 2005 to 3.27 at the end of 2015 and stands at approximately 3.4 today. 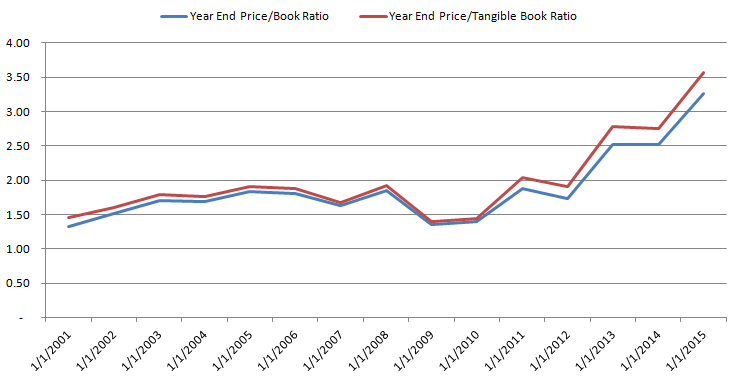 We can see from the exhibit that the price-to-book ratio was as low as 1.3 at the end of 2001. Clearly the market has massively increased the valuation assigned to RLI and this trend has been magnified in recent years. RLI is among the best insurance companies in the industry with an enviable long term record of underwriting profitability. However, the company has failed to grow rapidly in recent years as inadequate business was rejected in order to maintain underwriting profitability. The company has continuously generated significant free cash flow that could not be reinvested in the business. As a result, management pursued a repurchase program when the stock price was not as elevated relative to book value. 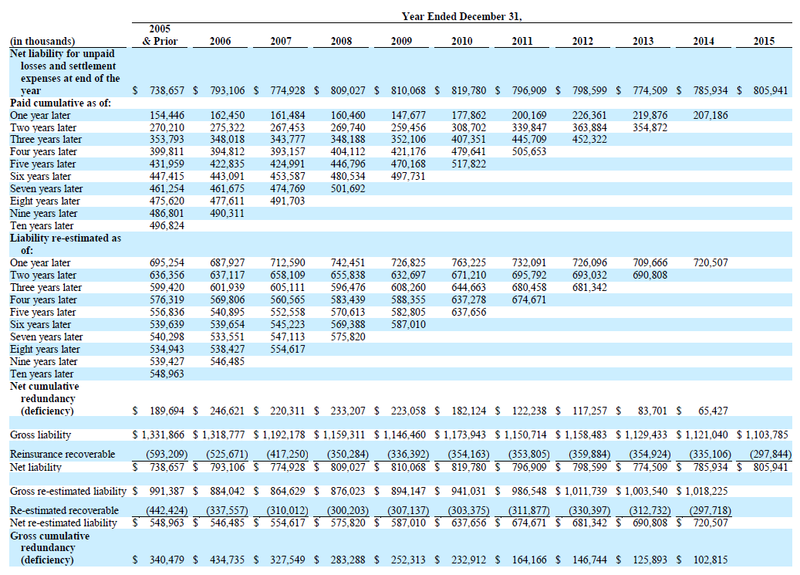 More recently, as the valuation increased, cash has been returned to shareholders primarily through special dividends. Although there is much that is positive to say about RLI, it is difficult to justify the current valuation especially in light of the limited growth and lack of compelling reinvestment opportunities. Although returning cash to shareholders is the right thing to do under the circumstances, the stock’s elevated level is likely to force management to pay special dividends, which are taxable to most shareholders, rather than to repurchase shares. We have profiled Markel Corporation in the past and note that the company has been able to grow more rapidly, both organically and through acquisition, over the past ten years and to do so while maintaining underwriting profitability. Although Markel’s average combined ratio is quite a bit higher than RLI’s combined ratio, Markel has retained all earnings and finds ways to redeploy funds internally. Markel also has a growing non-insurance group offering shareholders more diversification and making it more likely that the company will avoid taxable distributions to shareholders. At a price-to-book ratio that is less than half of RLI, Markel seems like the better value at current prices. Interestingly, Markel has long held a significant investment in RLI. Disclosure: No position in RLI Corp. Individuals associated with The Rational Walk LLC own shares of Markel Corporation and Berkshire Hathaway.